The global non-Hodgkin lymphoma therapeutics market has been estimated to reach USD 7.45 billion by 2023. The market is expected to register a CAGR of 7.4% during the forecast period, 2018 to 2023. North America dominates the market due to increasing technological advancements in the region. Increase in public awareness about NHL, robust drug pipeline for the treatment of the disease, improved diagnostic techniques to detect NHL, and increase in the prevalence of non-Hodgkin lymphoma are factors fuelling the NHL therapeutics market across the globe. High cost of NHL drugs and various complications associated with them are acting as a major restraint for the non-Hodgkin lymphoma therapeutics market. Additionally, increasing rituximab resistance and stringent regulatory guidelines are also limiting the growth of the market. The non-Hodgkin lymphoma therapeutics market is segmented by type of treatment and geography. By geography the market is segmented into North America, Europe, Asia-Pacific, the Middle East & Africa, and South America. 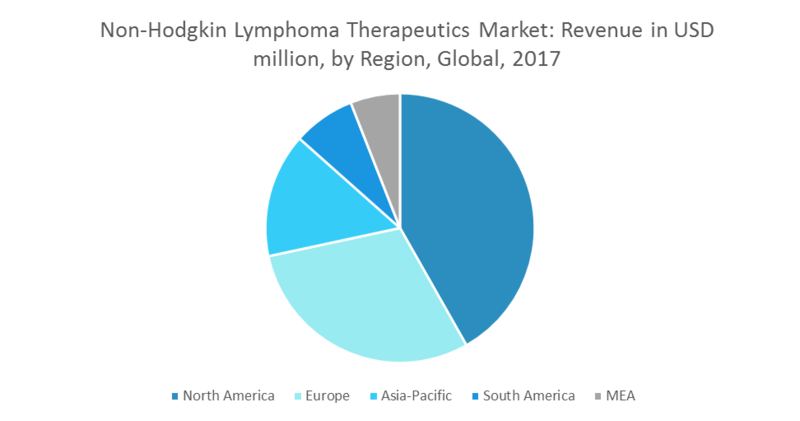 North America dominates the non-Hodgkin lymphoma therapeutics market due to increasing technological advancements and the rising incidences of NHL in the country. Asia-Pacific is also expected to propel the non-Hodgkin lymphoma therapeutics market owing to factors, such as increasing accessibility to healthcare facilities in the region and increasing prevalence of NHL. August 2017: Gilead Sciences, Inc. and Kite Pharma, Inc. announced that the companies have entered into a definitive agreement, pursuant to which Gilead will acquire Kite for USD 11.9 billion. Kite’s most advanced therapy candidate, axicabtagene ciloleucel, is a CAR T therapy currently under priority review by the US Food and Drug Administration (FDA). It is expected to be the first to be marketed as a treatment for refractory aggressive non-Hodgkin lymphoma. November 2017: The US Food and Drug Administration (FDA) approved the molecularly targeted therapeutic acalabrutinib (Calquence) from AstraZeneca for treating adults with an aggressive form of non-Hodgkin lymphoma, called mantle cell lymphoma, that has progressed despite at least one prior treatment. Major key players: F. Hoffmann-La Roche AG, Johnson & Johnson, Merck, Bristol Myers Squibb CO., Celgene Corp, Eli Lilly and Company., GlaxoSmithKline plc, and Bayer AG, among others..
9.1 F. Hoffman La-Roche Ltd.
9.4 Bristol Myers Squibb Co.